There’s a lot to love in Cartoon Network’s Over The Garden Wall, the network’s miniseries starring Elijah Wood as a neurotic teen who loses his way in a shadowy forest with his brother. The music goes a long way toward creating the unnerving atmosphere, with riffs on upbeat Disney-esque musicals, an astounding opening theme song, and scenes like disfigured pumpkin-headed people singing praises to their cult-like leader. So fans will be happy to hear that the stellar soundtrack is getting the love it deserves, with a Mondo release announced at Comic-Con and a wide release coming in August. 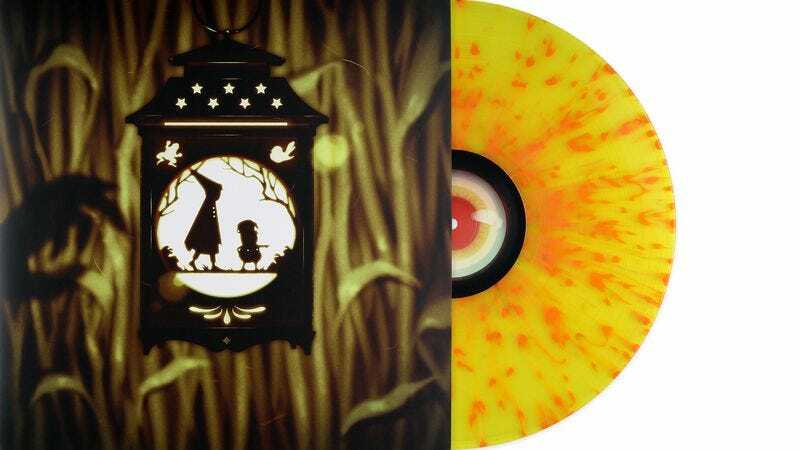 The album features 32 tracks of songs and score from Over The Garden Wall, along with a 20-age booklet with lyrics from every song and—in keeping with the sort of world that exists in The Unknown—sheet music so you can play the haunting tunes yourself. A pressed 180 Gram “Harvest Festival” colored vinyl will be available as a webstore exclusive, and widely available via Mondotees.com and exclusive retailers come August. Rounding out the package is original artwork by Sam Wolfe Connelly, whose art is very much in the style of the painterly series.